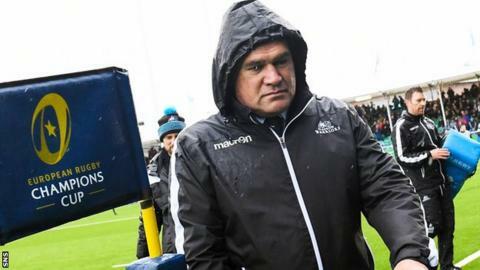 Dave Rennie says Glasgow Warriors may now prioritise the Pro14 above the Champions Cup after Leinster dealt a savage blow to their European hopes. The Irish side, inspired by Lions fly-half Johnny Sexton, were clinical in a 34-18 win at Scotstoun. The bonus-point win puts them in firm charge of Pool 3, but with no points from two games Glasgow look to be out of contention for the knockout stage. "Maybe Pro14 is going to be more of a focus," head coach Rennie said. "We'll probably have a look at it in December. Certainly with all our international boys going to be in and out, and depending on our injury ward, it may determine the mind-set we take into Montpellier in December." Stuart Hogg gave Glasgow a good start on his first appearance of the season, scoring the game's opening try. Leinster hit back strongly, though, with two tries from prop Cian Healy and one from the imperious Sexton giving the visitors an iron grip on the match. Tommy Seymour's try briefly hinted at a Warriors revival, but they never truly looked like hauling in their opponents, and Noel Reid's touchdown sealed the bonus-point win for the three-time champions. "We got outmuscled today, we lost the collisions," Rennie told BBC Scotland. "They carried strongly and got in behind us. When we carried they defended well in front of us. "They're a good side. I think we're better than what we put on the park today but it's a lesson. "We lost the penalty count 10-5, which allowed them to put us in the corner. We're aware teams are going to attempt to do that. "We got ourselves back in the game. I thought Tommy's try was a great example of building pressure, a high skill-set mixed in with some brutality. But too many errors today and they choked us down our end of the field." After a blistering start to the season with six wins from six Pro14 fixtures, Glasgow have found the step up to Champions Cup level difficult. They went down to English champions Exeter Chiefs on matchday one, one week after the exertions of a trip to South Africa to face Cheetahs in the Pro14. Rennie admits they will review how the rotation of the squad has worked in recent weeks, and feels his side need to add more weapons to their attacking game if they are to hurt the best defensive teams. "It's such a long campaign so we had to make sure we were freshening guys up, so we'll look at what we've done since we played in Africa," Rennie added. "We just lacked a little bit of a physical edge today, which was disappointing. "You've got so many months to go until you get to any play-off footy, so I think we can make lots of shifts. Certainly the brutality, our ability to go through the middle of sides and not just trying to run around them all the time, just to get a bit of balance to our attack."